So what did we end up with? 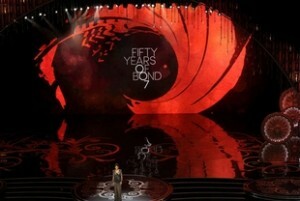 Well, to start off with Halle Berry was the presenter of this tribute. Now while I myself have no problem with Ms. Berry or Die Another Day, it really begs the question of: “This is the best Bond Girl they could get? After that the actual tribute really left a lot to be desired: a three minute montage of all the films set to one of the most generic versions of the Bond theme I ever heard. If that wasn’t so bad, the clips chosen really seemed random. I’ve seen better Bond tributes on youtube put together by the fans. If you haven’t seen any yet I suggest you go to youtube right now and watch as many as you can. The montage did pick up a bit when the orchestra switched over to an instrumental of Live and Let Die, but by that point it was too little too late. When the video was over Shirley Bassey came out onstage to sing Goldfinger. Not horrible, in fact I’ll even give her props for doing a good job. But it was the fiftieth anniversary you think they’d pick a song that reflected the Bond as a character, such as Nobody Does It Better or even You Know My Name. Instead once again Hollywood shows how narrow minded they are when it comes to Bond and picks the song from the one film “everyone” believes is the best Bond film ever. Thoughts? Opinions? Feel free to share them in this Oscar discussion thread.